Personal Tax Advice: Double Up on Deductions - Sitzberger & Company S.C.
As a taxpayer, knowing when to pay tax deductible expenses can significantly lessen your individual tax burden. When computing your taxable income, the IRS gives taxpayers two options: take the standard deduction set by the IRS, or itemize your deductions (which includes items like real estate & state taxes, mortgage interest, and charitable contributions paid in the current year). Taxpayers have considerable discretion as to the timing of payments of certain itemized deductions. Items like real estate taxes and estimated state tax payments can be paid before or after December 31st and charitable contributions can be concentrated in a more beneficial year as well. In Wisconsin you can even prepay your entire estimated taxes for the upcoming year by filing Form A-115. A way to reduce the amount of total tax owed is to accelerate enough itemized deductions into the current year to make the subsequent year’s itemized deductions below the standard deduction (or vice versa). This way of reducing your taxes is called doubling up or bunching. 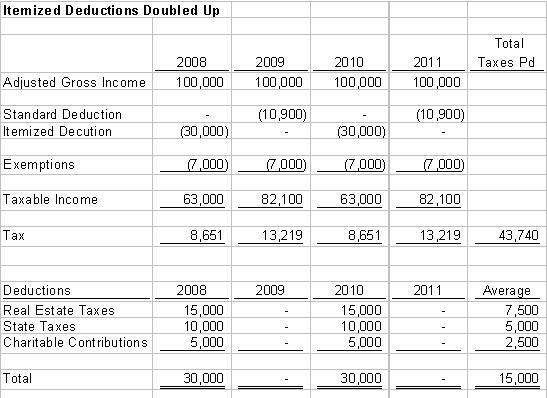 The benefits of doubling up your itemized deduction.